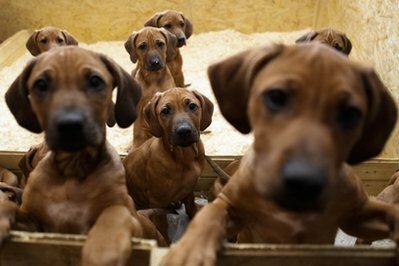 A dog, a Rhodesian Ridgeback, in Germany has given birth to 17 puppies! The owner of the dog has had to bottle feed some of the puppies because the mother cannot handle feeding all the pups. But miraculously all the pups survived! There are 8 female puppies and 9 males. All the pups have African names because that is where their breed is from. The females puppies are called Bahati, Binta, Bahya, Bashima, Batouuli, Binki, Bora, Bisa and the male ones are Baakir, Banjoku, Belay, Bruk, Bundu, Bayo, Bukekayo, Biton and Bulus. So far four of the puppies have been sold and 2 more are fully paid for. To read the full story at news.yahoo.com. This breed was developed in South Africa and were used to hunt lions. The most distinctive feature of the breed is the ridge of hair along the dog’s spine which grows the opposite direction of the rest of the fir. 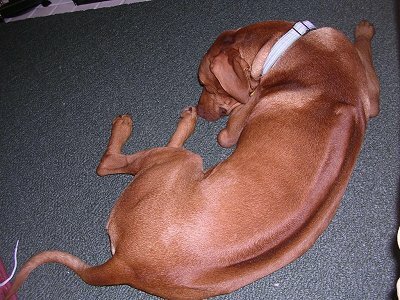 Males can weigh up to 85 pounds, and females 70 pounds. These dogs are very muscular. The breed is loyal and intelligent. They often choose to ignore strangers, but are protective and can be taught to be good guard dogs.